PsychCentral has an interesting summary for one of the more pervasive forms of personality disorder that some people face in a marriage or divorce, and yet this form of Personality Disorder is not well understood. There is a significant comorbidity ( co-existence) with other personality disorders. This personality disorder/trait exists in about 2.5 percent of the population, and like NPD and BPD, and the toxic behaviors can be aggravated by a marriage that is failing, or with a divorce. My firm has been dedicated for many years to a) understanding these traits and toxic behaviors, and b) managing them within the context of divorce and custody litigation. 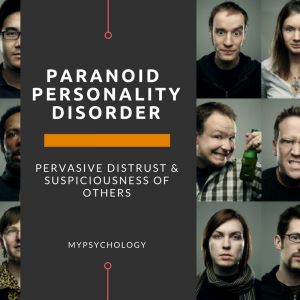 ” People with paranoid personality disorder are generally characterized by having a long-standing pattern of pervasive distrust and suspiciousness of others. A person with paranoid personality disorder will nearly always believe that other people’s motives are suspect or even malevolent. Individuals with this disorder assume that other people will exploit, harm, or deceive them, even if no evidence exists to support this expectation. While it is fairly normal for everyone to have some degree of paranoia about certain situations in their lives (such as worry about an impending set of layoffs at work), people with paranoid personality disorder take this to an extreme — it pervades virtually every professional and personal relationship they have. Individuals with Paranoid Personality Disorder are generally difficult to get along with and often have problems with close relationships. Their excessive suspiciousness and hostility may be expressed in overt argumentativeness, in recurrent complaining, or by quiet, apparently hostile aloofness. Because they are hypervigilant for potential threats, they may act in a guarded, secretive, or devious manner and appear to be “cold” and lacking in tender feelings. Although they may appear to be objective, rational, and unemotional, they more often display a labile range of affect, with hostile, stubborn, and sarcastic expressions predominating. Their combative and suspicious nature may elicit a hostile response in others, which then serves to confirm their original expectations. Because individuals with Paranoid Personality Disorder lack trust in others, they have an excessive need to be self-sufficient and a strong sense of autonomy. They also need to have a high degree of control over those around them. They are often rigid, critical of others, and unable to collaborate, and they have great difficulty accepting criticism.